Noida is a part of Delhi-NCR that has sprung up due to modern needs of an expanding zone. The development of Noida and its latest cousin Greater Noida has been nothing short of spectacular. The area is a destination for many modern workspaces, IT, industries, and is also the preferred location for many to live. With wide roads&sound infra and being a bustling hub, this area has many schools, hospitals, malls, multiplexes, and reputed offices. A new development called World Trade Center Quad is coming up in this area. When one gets to work in a promising office, it may be located far from actual residence, and the long and tiring commute everyday can take the fun out of the job. Living near one’s workplace is like a dream, but most of the homes in plush areas are too expensive. Here is where WTC Quad Noida creates a niche solution. It offers work-homes next to the workplace. These are efficient and compact spaces that one can retire to after a heavy long day of work. Thus, the apartments in this project essentially start as studio offerings, ideal for single occupancy or a small family as well. The apartments start at 570 sq. ft. of area here.Less space does not mean compromising on quality and luxury. For each home is an epitome of comfort with hi-end specifications. The ceilings are high and the interiors are flexible & adaptable to changing requirements of the residents. 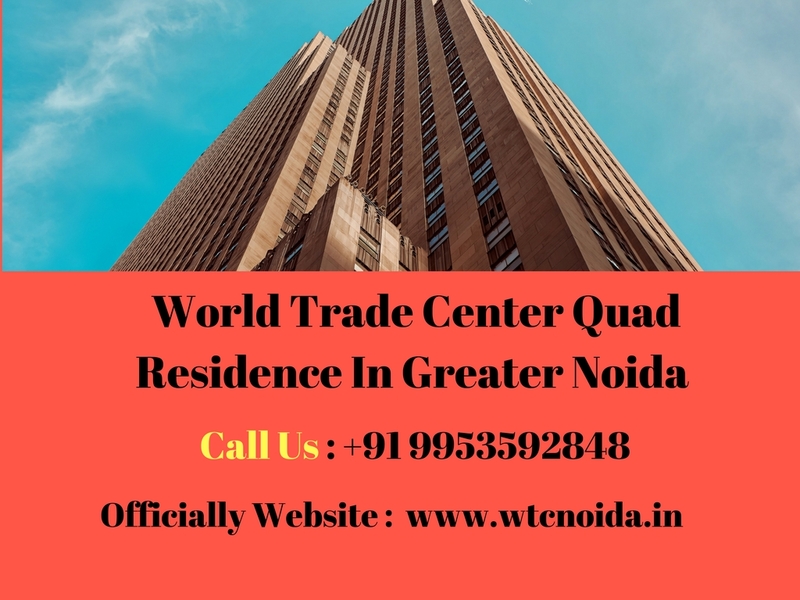 WTC Quad is located in Tech Zone 1, Greater Noida. This means that elevated transport corridors are well-linked to this site. There are many reputed projects nearby, as are a proposed Night Safari, international airport, and a metro line. It is the nerve of modern entertainment with the F1 Circuit and Sports City nearby. The campus itself spreads over 42 acres. There are 20 distinct buildings here. There are 384 liveable units here divided into 4 towers. The campus has 3 million sq. ft. of office space and 2000+ people are already working in the complex. On completion, the complex is expected to have a footfall of 70,000+. WTC Quad price starts at an unbelievable Rs. 19.95 lakhs. Along with stylish homes, there are facilities for recreation like a jogging track, kids’ play area, sports areas, gym and large open spaces.